I arrived to Florence with a Google Map listing all of the restaurants that I wanted to try, and unlike my trip to Rome where most things were closed because of the summer holiday, in Florence almost every place I planned to visit was open. Besides falling in love with the beauty of the city, I also fell in love with the food. I tried numerous wines, and gelatos, and pizzas, and pastas. I ate non-stop and I even extended my trip in the city to make sure that I was able to visit the majority of places that I had mapped out. The food I ate has been broken into two sections: this one, which covers the meals I ate and a second one entitled ‘Eating My Way Through Florence: Gelato Edition’. Acqua Al 2 was personally recommended to me by a former co-worker who studied in Florence. She told me that I must go there and try their blueberry and balsamic steaks, so that is what I aimed to do. If you live in Washington, D.C. or San Diego, California, you may be familiar with the name Acqua Al 2, as it has now expanded to include two locations in the United States outside of the original location in Florence. You can find the Florence location tucked away on a side street away from the hoards of tourists and hidden in plain sight. In addition to the cute decor, the ambient lighting, and the plates on the walls signed by famed celebrities and local actors, I really enjoyed the steak. I ordered the Assaggio di Secondi, which included Filetto al Mirtillo (Steak Filet with blueberries), Filetto all’aceto Balsamic (Steak Filet with Balsamic sauce), and Tagliata Alla Rucola in Focaccia (Sliced steak and Rucola in Focaccia bread). I had never paired fresh blueberries with steak before and it was just divine. My favorite part of the meal however was the Filetto all’aceto Balsamic (Steak Filet with Balsamic sauce). Oh. My. Gosh. Yum. The price was moderate at €30 including the cover charge (‘coperto’), mineral water, the meal, and the service charge. Simply put: this has been my FAVORITE steak to date. Like, in my entire life. I can’t even properly put into words both the tastes I encountered and emotions this steak made me feel (I will tell you though that my wallet dropped a couple of pounds after this meal, but it was definitely worth it). Bistecca alla Fiorentina is a dish that you must DEFINITELY try while you are in Florence, as it is a dish that the city is well-known for. I had my steak at La Beppa Fioria, a restaurant that is kind of hidden on a side street in the Oltrarno area that is popular with the locals. At Buca Poldo, located in a small alley conveniently located near Palazzo Vecchio, I ate penne with salmon (Penne al Salmone). It was very delicious and for the location it was VERY reasonably priced (€12,50 including mineral water and servizio). When you think of Italy, you probably do not think of beer right? Neither did I until I discovered this little gem of a place called Mostodolce by Florence local Ivo Riccio. Conventionally located near the Firenze Santa Maria Novella train station, Mostodolce manufactures their own unfiltered craft beer. Outside of Prague, I found their Martellina beer to be one of the best beers I have ever tasted; it was very light, had a great taste, and was as smooth as water. Their pizza was pretty decent as well and was very inexpensive for the area at €5. I went to Enoteca Bevo Vino in Oltrarno on a suggestion from Girl in Florence (she has some seriously amazing recommendations for food in the city). I only intended to have a glass of wine and people watch until a regular patron approached me, sat down for a drink with me, and recommended I try the bruschetta. After a failed attempt to find the famous Gusta Pizza (which I found out was closed because of the holiday), I met some locals who told me to grab a slice at the nearby Toto atto II. Located right near the Pitti Palace, Toto atto II serves up slices to hungry travelers. The atmosphere seemed to cater mostly to tourists and the prices were a little high for the quality, however the place was packed the entire time I was there. I love beef. I also love cows, but I never thought I would see the inside of one, let alone eat it’s stomach, but that is exactly what I did at the Il Mercado Centrale. The Mercado is a large and wonderful foodie heaven with different varieties of food ranging from pizza to pasta to gelato. There is even an Eataly inside of the Mercado where you can buy a number of different fresh Italian foods and spices. I met a girl from Couchsurfing who had been to the market and had tried the Vaschetta di Lamperedotto (another of Florence’s signature dishes) and recommended I try it. In all honesty, I was terrified to try it when I first saw it. A full piece of stomach was lifted out of boiling water, chopped up into tiny pieces, and placed on a bun before being dipped in the cooking sauce and covered with a green sauce. And you know what? After I got comfortable with the idea of eating it, I actually really enjoyed it! Le Giubbe Rosse is a literary cafe that opened in Florence in the late 19th century. It was frequented by artists, intellectuals, world leaders, and authors. Today, artists and intellectuals still meet at the cafe along with a large number of tourists who come to dine at the famous establishment. While I originally intended to go their solely for a coffee, my stomach has other plans (and I am glad that it did). I ordered the Tagliatelle con Funghi (tagliatelle pasta with mushrooms) and enjoyed it very much. In true Italian fashion, I paired it with a nice white wine which was also very lovely. One thing that I really love about Florence is the amount of great restaurants and food options throughout the small city. My Google Map was literally filled with numerous restaurants that I wanted to try while I was there, but unfortunately did not get a chance to. 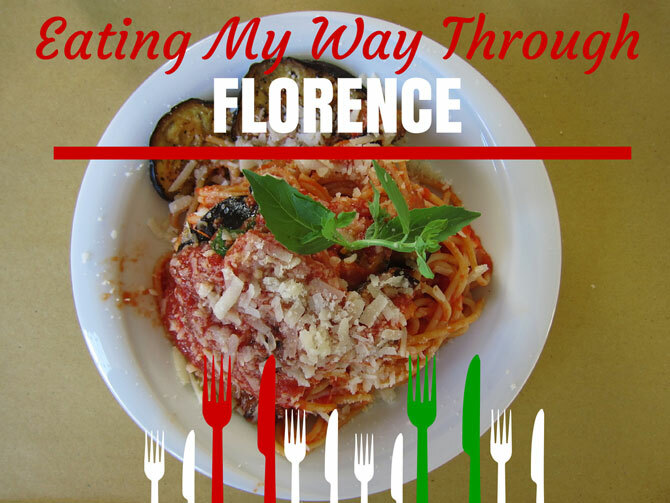 Have you ever eaten in Florence? What were your favorite places? Final note: You may be wondering about the ‘cover charge’ that I paid at some of the establishments that I ate at in Florence. Everywhere outside of Rome, it is acceptable for restaurants to charge a cover charge. For more specific details on eating in Italy, check out The Do’s and Don’ts of Eating in Italy by Walks of Italy, a great resource for all things Italian. Props – Great photo of the Penne. I loved the lamprodetto there too. All of the food looks ridiculously delicious and is making me want to plan a return visit to Florence. Yum! Every time I look at the pictures I want to go back and eat everything again! The best steak of my life Andrea! Thanks for coming by CompassionateLee! When you make it to Italy, make sure to visit Florence! I lived in Florence when Acqua al 2 was on Via del Acqua and it was tiny…nice to see it is still going strong. Yes, and it has even expanded into the US Susan! My coworkers recommended that I go to Acqua Al 2 as well, so I went on my first night, ordered their pasta sampler and the blueberry steak as recommended. I can only agree that the blueberry steak pairing was interesting, but my steak was way overcooked, and drenched in too much sauce. The pasta was so “meh” that I couldn’t believe I was eating it for dinner, major food FOMO. I felt like I wasted a meal there when there were so many less touristy, more authentic experiences around. The fact that they opened 2 branches in Washington DC and San Deigo should have been a good sign for me to avoid it. Now, La Beppa Fioria… THAT really was an amazing experience, exactly what I travelled all the way to Florence for. So I would say skip Acqua Al 2, and go seek out a Florentine Steak instead. Hi Shelly! I wasn’t able to try their pasta, but sounds like it wasn’t too good. I agree that the best place to try a steak in Florence (IMO) is La Beppa Fioria. It was so amazing!